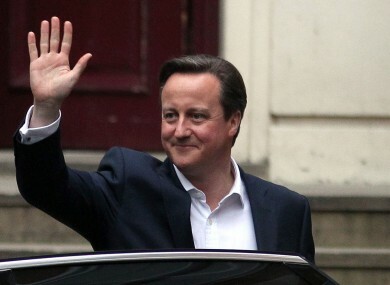 DAVID CAMERON IS back at Number 10 Downing Street this afternoon, after a surprise victory in the UK general election. Labour’s Ed Miliband, the Liberal Democrats’ Nick Clegg and Nigel Farage of UKIP have all stepped down from their party leaderships. It had been billed as the most unpredictable British general election in decades, with many polls indicating it was too close to call. But as the results came in, throughout the early hours, it became clear the Tories were on course for victory. At lunchtime, it was confirmed that they had reached enough seats to claim a slim majority. And after gains throughout England and Wales, the BBC is now projecting the party will be returned with 331 seats in the Commons. After a visit to Buckingham Palace and an audience with the Queen, Cameron said in a speech back at Downing Street, that he would draw on the country’s “unrivalled skills and creativeness” to “build an even prouder future” and an even greater Britain. Sending his congratulations, Taoiseach Enda Kenny said he looked forward to his next meeting with the Prime Minister “to build on our very close relationship and to continue our work on sustaining and developing the strong and positive relationship that exists between our two countries”. I look forward to renewing our engagement on the full range of issues of common interest to the UK and Ireland. I take the opportunity to extend my congratulations to all those who were elected, including those in Northern Ireland. The Conservatives will be the largest party with around 331 seats. Forecasters say the Labour party will take just 232 seats. Labour leader Ed Miliband has resigned. Nigel Farage has stepped down as UKIP leader, after failing to gain a seat as an MP. Nick Clegg has resigned as leader of the Liberal Democrats. His party is set to win just 8 seats. The Scottish National Party (SNP) took 56 of the 59 seats in Scotland, hammering Labour – whose own Scottish leader, Jim Murphy, lost his seat. In Northern Ireland, Sinn Féin lost out in the most marginal constituency in the country, with the Ulster Unionists gaining two seats (up from zero) – in Fermanagh and South Tyrone. Just after noon, Miliband gave his resignation speech, thanking Labour supporters for their hard work on the campaign. “I just this party aged 17, I never dreamed I would lead it,” he said, telling the party’s members that they had “come back before and will come back again”. Clegg, meanwhile, said history would look kindly on the Liberal Democrats performance in government, in his resignation speech. “Fear and grievance have won. Liberalism has lost,” the former Deputy Prime Minisiter said of the election result. Meanwhile, Farage failed to gain a Westminster seat in Thanet South, despite a strong showing. Conceding to Conservative Craig Mackinlay, he gave an upbeat speech – but later confirmed he would be following through on his campaign pledge, and quitting as leader. Former Conservative MP Douglas Carswell will be UKIP’s only presence in the Commons as a result, and the 44-year-old is now odds-on to take over at the helm. With reporting by Daragh Brophy and Sinéad O’Carroll. This post will be updated throughout the day. *326 seats are needed for an overall majority, but in practice this can be achieved with 323 seats as Sinn Féin MPs don’t take up their seats and the Speaker of the House doesn’t vote. Email “Miliband, Farage and Clegg have all quit - and David Cameron's back at Downing Street”. Feedback on “Miliband, Farage and Clegg have all quit - and David Cameron's back at Downing Street”.